Investors are freaking out over lower oil prices, sending oil stocks lower. Drillers, on the other hand, don’t see a problem and plan to keep on drilling. Oil stocks have been hammered by investors as a result of the plunge in oil prices. 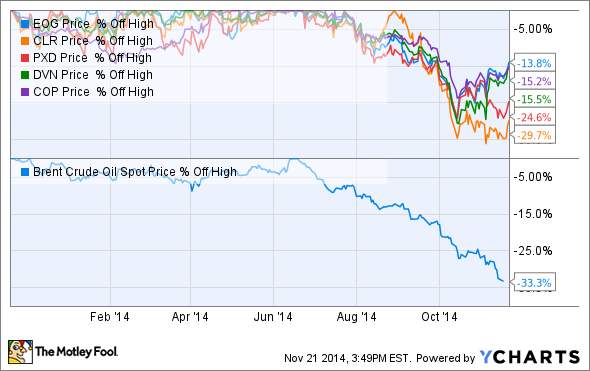 That's pretty evident on the following chart as oil stocks took a notable dive alongside oil in October. What's pretty remarkable is that despite the oil price-fueled drubbing, these companies aren't a bit worried about the fall in oil prices. In fact, all five companies plan to keep on drilling next year pushing oil production higher. The reason behind the growth push is simple, even at lower oil prices these companies can still make a boatload of money. Take EOG Resources (NYSE:EOG) for example. The company's management team isn't worried about low oil prices because, as CEO Bill Thomas puts it, "our large high-quality drilling portfolio still generates exceptional returns with $80 oil." The company is actually earning direct after-tax rates of return of around 100% throughout its portfolio at $80 oil. Further, as the following slide points out the company can still eke out an acceptable return if oil prices are cut in half. As that slide notes, the company can make money even if oil drops to $40 per barrel. However, because its returns are still fantastic at today's $80 oil environment, the company plans to continue to deliver best-in-class crude oil growth in 2015. A similar story is being told by most other drillers. Devon Energy Corp. (NYSE:DVN), for example, is still planning to deliver 20-25% oil production growth next year while keeping its capital spending roughly in line with 2014 levels. This is because it's also enjoying strong rates of return at lower oil prices as it will simply shift its drilling focus to its best return areas. It doesn't hurt that the company has a strong hedge book to help mitigate some of the impact of lower oil prices, as well as a very strong balance sheet. That sentiment is echoed by Pioneer Natural Resources (NYSE:PXD), which still expects to deliver companywide production growth of 16%-21% over the next two years. This is despite the fact that it sees a $70-$80 oil price environment over those two years. However, because of its strong returns of 40%-80% in that oil price range, and the fact that 85% of its production is hedged through the end of next year, it's not really all that worried about the lower prices. ConocoPhillips (NYSE:COP), likewise, isn't planning to back off on its production growth next year. The company is in the middle of a multi-year growth plan that will see it grow production by 3%-5% per year through 2017. While the company is cutting its capital spending a bit next year, the capital being cut would have been directed at higher risk exploration or appraisal projects that were not going to move the needle next year anyway. Instead, the company is focusing its capital spending next year on developing its high margin Eagle Ford and Bakken shale assets, which are what have been fueling a good portion of its production growth over the past couple of years. Then we have Continental Resources (NYSE:CLR), which is keeping its capex flat with 2014 levels, but still projecting 23%-29% production growth next year. While the company had been planning to spend $600 million more next year, that extra spending would have only pushed production growth up a little bit to 26%-30%. The other interesting note is that of the group Continental Resources is the one sneering the most at oil prices. It recently made a $433 million profit by liquidating its oil hedges resulting in a big bet that oil prices have bottomed and that the company will make even more money on a recovery. While most drillers are pulling back a little bit on spending next year, all five companies are still planning strong production growth in 2015. This is because even with the plunge in oil prices there's still plenty of money to be made on oil. That's a fact that seems to have been lost on investors, who sold oil stocks off when oil prices went down. But, this is all good news for investors that held their shares as there's plenty of upside in oil stocks.